O’Zapft is! 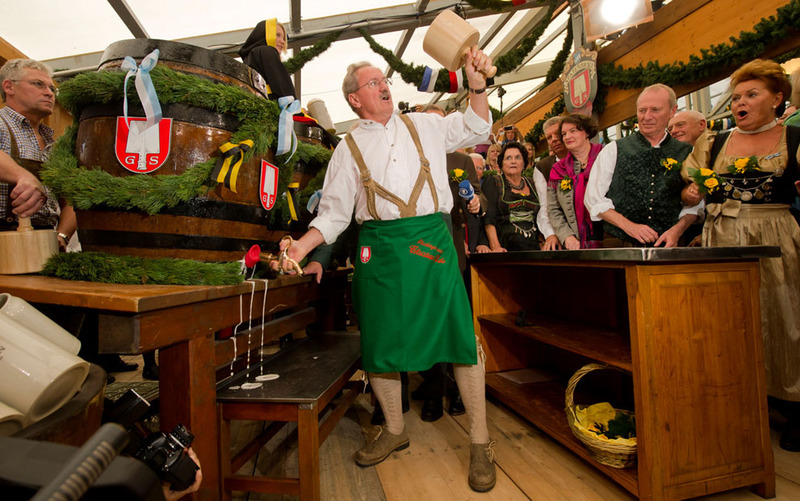 This is the phrase in Bavarian dialect with which every year, from 1950 onwards, after the second world war which interrupted the festival for a few years, the Mayor of Munich at the official opening of the festival, opens, indeed breaks, the first barrel in the Schottenhamel tent. Translated into German it would be: “Angezapft ist es” or, even better: “Es ist angezapft”. 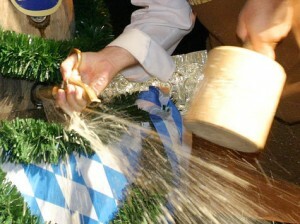 The word “anzapfen” indicates a tap with a wooden hammer with which a barrel of beer is opened. 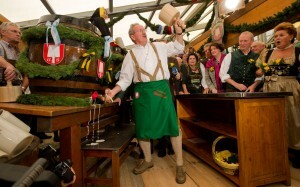 This phrase, in Munich, is a kind of magic word meaning: time to party, which starts the dancing! At this point, twelve firecrackers are set off from the steps of the statue of Bavaria announcing to the hosts (the Oktoberfest stand owners) that the beer may be served. In 1950 Mayor Thomas Wimmer only managed to open the inaugural barrel of beer after 19 hammer blows (still the worst record), while the record belongs to Mayor Ude, the quickest with just two hammer blows.